You must have been surprised looking at the name of the recipe that I am going to share with you today. 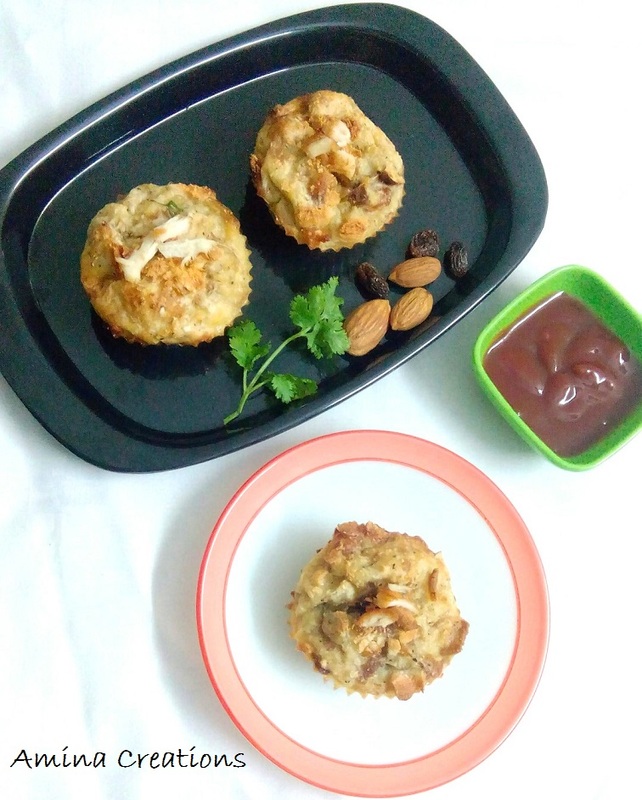 I have called it All-in-one muffins because; it has chicken, spinach, eggs, wheat bread, almonds and raisins which are all rich in iron and very healthy. Nowadays, iron deficiency is very common in women and the sad part is that most of them are not aware of it to fight it. Hair fall, tiredness and pale skin are some of the common symptoms of iron deficiency. Anaemia can be avoided by following a healthy lifestyle along with an iron rich diet. Spinach, Beetroot, oats, eggs, chicken, fish, etc are all rich in iron and including them in our regular diet is very helpful in fighting iron deficiency. So it is better to start at the earliest and eat foods that are rich in Iron. All-in one muffins are iron rich, easy to make and are simply delicious. You can make this for breakfast, brunch or as a snack with tea. 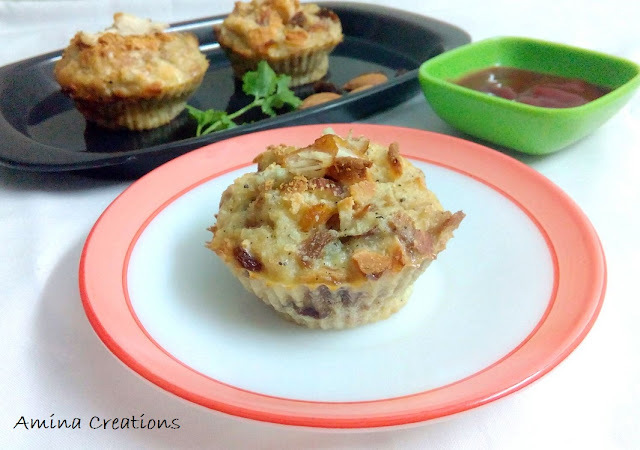 I served it as an evening snack along with tomato ketchup and everyone at home simply loved it. These muffins are a perfect combination of health and taste. 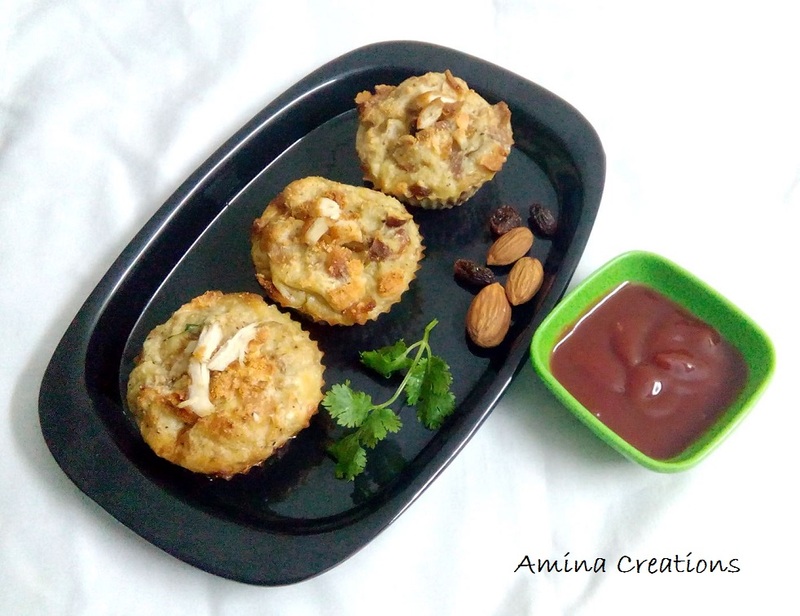 The good thing about these muffins is that you can modify it according to your taste by adding more vegetables or lentils or any other seasoning to make it more healthy and tasty. Take shredded chicken in a bowl, add tomato sauce and mix well. Keep ready. Break open 2 eggs in a bowl and whisk well till the egg whites and yolks are well mixed. Next add milk, shredded chicken and blanched spinach leaves and mix well. Tear the wheat bread into small pieces and add to this. Now add almonds and raisins and mix well. Spoon this mix into muffin moulds and add grated cheese on top. Place it inside the oven over a grill rack and bake for 15 to 20 minutes till a toothpick inserted comes out clean. Remove the muffins from the oven and serve hot with tomato ketchup. You can add boiled beetroots, broccoli or any other vegetable of your choice. I used silicon moulds, so I did not grease the moulds. If you are using normal muffin moulds, grease them with some oil or butter. Increase the proportion of ingredients to make more muffins. I hope you would try out this recipe soon. Eating food that is rich in iron along with a healthy lifestyle would help in a long way in fighting iron deficiency. Livogen is running The Iron Chef recipe making contest to spread the awareness about the importance of iron in the diet and crowd-sourced iron rich recipes. So friends, if you too have an unique Iron rich recipe, participate in the contest and stand a chance to get featured in Femina as a Celeb Chef. Top 3 winners will win vouchers worth Rs. 20,000 and the next 7 will win vouchers worth Rs. 5,000. For more information you can check out www.livogen.in/iron-chef.